Let’s Be Cops! Let’s not . . .
Until I’ve finishing this review. Ah ha! Anyway . . .
Nick and Original Pilot Coach from New Girl decide to be cops leading to an OTT but highly watchable action comedy. That’s what you get! Some of the better bits are in the trailers and I feared that there would be little in between. 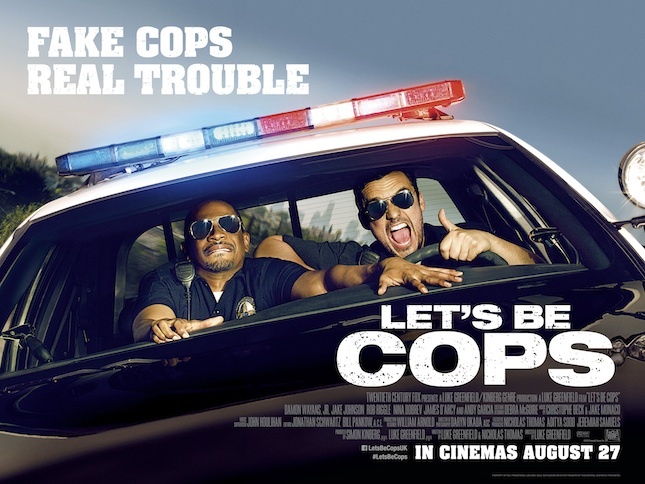 However, it was all down to the partnership and chemistry of Jake Johnson and Damon Wayans Jr that allowed jokes that really should have been mediocre and ridiculous, quite entertaining. Certain jokes still fall flat on their backside. An initial joke in which Justin (Wayans Jr) tells a line of apprehended Russian mobsters to put their hands on their heads and body pop started off funny but went on too long. Facebook selfies with rifles. Silly but okay. I guess it’s down to what mood you’re in. If you think the premise is ridiculous then do not bother. It’s get a whole lot crazier and a whole lot sillier. But if you’re up for that then bienvenue, wilkommen, welcome! Most of the heavily advertised funny bits in the trailers were done in the first 20 minutes. Although funny, if you’ve been unlucky to see them numerous times it’s highly predictable. I’m worried that Johnson may be typecast into playing Nick now for the rest of his acting career. I hope I’m wrong. It works this time round even if his character is a little more demented. The guy practices knife combat training with a kid he met in the park. Crazy. His impulsive EBay purchase of an old police vehicle and combat education from YouTube videos was too scary a concept with this day and age. The plot is hardly original. Two thirty year old slackers that are either frustrated with work (or not working at all) get given an opportunity to be somebody (well pretend to be somebody), inevitably leading to hi-jinks and upsetting the Russian mob. James D’Arcy (Master and Commander: The Far Side of The World) didn’t do too badly as the Russian psychopath. He had the acting conviction but not the body to pull it off. It was hard to be intimidated by his scrawny demeanour. But at the same time, with the tank sized henchmen at his disposal, does he need to bulk up? The supporting cast certainly do help make this film work. An unrecognisable Keegan-Michael Key (Fargo) played the highly agitated and crazy drug peddler Pupa to perfection, delivering the gags where the pace seemed to dip. Nick (Johnson), I mean Ryan’s interpretation of waterboarding Pupa for information was hilarious. Natasha Leggero’s (Suburgatory) crazy cougar cameo wowewewow. For others, they may find her irritating and stupid but me . . . and Nina Dobrev (The Vampire Diaries) oh my goodness. Okay, I’ll stop. Wayans Jr and Dobrev play the inevitable couple subplot spiel as well as they can. But it’s still corny and predictable as hell. I was surprised to see Rob Riggle playing it straight faced for a change. Especially after his hilarious supporting turns in 22 Jump Street and Step Brothers. However, it works so much better. And Andy Garcia, where you been? Great to see him back in movies and poking fun at himself. Even if he plays it incredibly straight faced. I think he was the only person doing some proper “acting” acting. Johnson and Wayans Jr work well together. Their characters will hardly top the action comedy duos of all time but they certainly help make this film more enjoyable than it should be for all its clichéd and OTT guff. They can make as many Lethal Weapon references as they want but Riggs and Murtaugh they ain’t. Wayans Jr was definitely the scene stealer for me. He does his father proud, following his style but is still able to put his own stamp on it. It’s corny, predictable, OTT but it’s not the worst way to kill 100 minutes and it delivered more laughs than I expected. However, the best cop com movie for me is still 22 Jump Street, which this one falls short of. But NOT BAD. For me, it’s a 3/5.